Abstract: Background and Rationale: The GnRH antagonists’ obstruction of pituitary GnRH receptors can hinder the LH surge as well as the interruption of FSH production and further arrest of follicular development (Ditkoff et al.,1991; Kettel et al., 1991). On application of GnRH antagonists to natural cycle IVF, addition of exogenous gonadotropins are needed to maintain follicular growth. GnRH and eCG have been used in timed artificial insemination (TAI) protocols to improve the pregnancy rate (PR) in cattle (Gaievski et al., 2015). Therefore, it was interesting to investigate the role of GnRH antagonist such as ganirelix. The ganirelix (orgalutran or antagon) is a synthetic decapeptide and an injectable competitive GnRH antagonist used in ART to control ovulation. It prevents the premature LH Surge (Lambalk et al. 2006) and can interact with hCG. Ganirelix prevents ovulation until it is triggered by injecting gonadotropin. The eCG is used in superovulation and other purposes in cattle and buffaloes. Therefore, the possible drug-macromolecule interactions between ganirelix and eCGα subunit as a model for other gonadotropins was used. Objectives: The goals of this study are: (1) to generate, validate and visualize the 3D model of the gonadotropin alpha; and (2) to determine whether any drug-macromolecule interactions exist between ganirelix and gonadotropin alpha and to gain an insight into the structural mechanism of target macromolecule recognition by ganirelix. Methodology: The PCR amplification, cloning and custom sequencing of eCGα was done. Afterwards, we analyzed the translated amino acid sequences of the ORF corresponding to the cDNA by ORF Finder, coding potential calculator (CPC), NCBI BLAST as well as other bioinformatics tools such as CLC sequence viewer, DNASTAR Lasergene software suite version 7.1, PSIPRED bioinformatics software, MEGA 7.0.14 . 3D homology model: The model was generated by Geno3D and was evaluated by Ramachandran plot, main and side chain parameters and residue properties by PROCHECK, Z-score, SWISS-MODEL, ANOLEA, GROMOS, QMEAN6 and VADAR servers. The model was visualized by using 3-D Molecule Viewer of Vector NTI, and PyMol. The probable binding sites were identified by MetaPocket 2.0. Virtual screening and molecular docking: PyRx-Virtual screening tool version 0.8 (pyrx.sourceforge.net, Scripps Institute) was used for virtual molecular screening and docking with the lead compound ganirelix. A grid box with a size of 63.93 Å (X), 42.69 Å (Y) and 25.0 Å (Z) was used. The centre of the grid box was allocated using x, y, z coordinates of -2.72236290175, 1.41345873493 and 0.6341, respectively. Docking poses of ganirelix-eCG alpha docked structures were visualized using the PyMOL v 1.8.2.0 software 32 and the protein-ligand interactions were generated using the LigPlot+ v.1.4 software. Conclusions and Discussion: The molecular docking results demonstrate the stabilization of CG-ganirelix complex through several hydrophobic interactions and hydrogen bonds and these might be critical factors for regulating target protein activity. The outcomes of this study justify the feasibility of alternate route of gonadotropin (based on eCGα model) sequestration by interactions of alpha subunit with the ganirelix. This may elucidate an alternative possibility for ganirelix-mediated gonadotropin suppression directly by binding apart from GnRH receptor blocking. 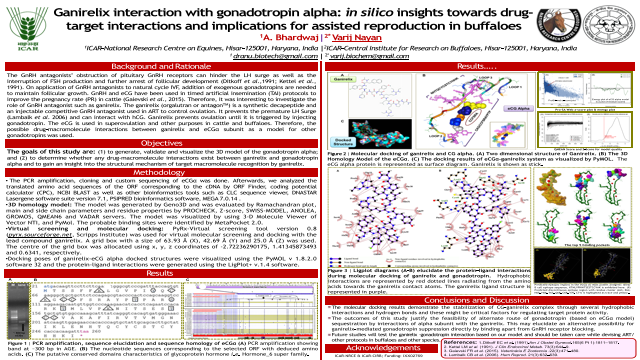 Future studies will test the ganirelix –gonadotropin interaction based on our model and should be taken care while devising ART/ other protocols in buffaloes and other speciesSummary: Ganirelix interaction with gonadotropin alpha: in silico insights towards drug- target interactions and implications for assisted reproduction in buffaloes.References: References: 1.Ditkoff EC et al. (1991). Am J Obstet Gynecol. 165(6 Pt 1):1811–1817. 2. Kettel LM et al. (1991). J Clin Endocrinol Metab. 73(3):644–9. 3. Gaievski FR et al. (2015). Veterinária E Zootecnia. 22(3):471–480. 4. Lambalk CB et al. (2006). Hum Reprod. 21(3):632–639.